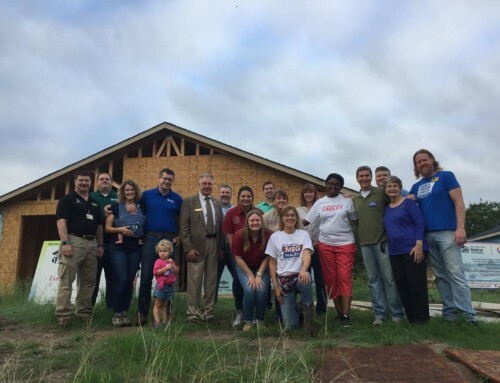 The Bryan and College Station City Councils have declared tomorrow B/CS Habitat for Humanity Day in honor of Habitat’s 25th anniversary in the twin cities. It was on October 16, 1989, that Habitat for Humanity International sent Sam Sharp a letter to officially approve the new Habitat affiliate in Bryan and College Station. Since then, Habitat has been building homes that enable low-income individuals and families to build better lives. The first two Habitat homeowners in B/CS spoke at our 25th anniversary celebration last month and illustrate the power of a decent, affordable home. 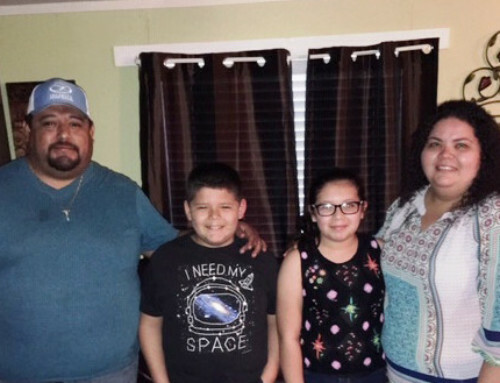 Victor and Amelia Gonzalez didn’t really know what they were getting into when they applied to build the first local Habitat house back in 1989. They were living in a dilapidated trailer with holes and no heat. Victor, who was struggling with the onset of diabetes at the time, remembers the water in their toilet freezing during a cold winter. But life improved for the young family when they moved into their Habitat home in 1990. Victor and Amelia raised their five sons in the safety and stability of that house and last year paid off their mortgage. Janice Kelley, the second Habitat homeowner and the first in College Station, also paid off her mortgage last year. She was a young mother with three small children when she moved into her new home in 1991. Her youngest graduated from Texas Christian University and works at Twin City Mission. And now Janice is about to become a college graduate herself. She’ll complete her degree at Sam Houston State University in December and plans to work with teenage parents to help them stay on the right path. These Habitat homes provided the foundation for the Gonzalez and Kelley families to build better lives for themselves and future generations. Thanks to the tremendous generosity of people in our community, more than 1,000 people – including hundreds of children – now live in Habitat homes in Bryan and College Station. While these accomplishments are worth celebrating, we still have much to do. The need is still great. Too many individuals and families live in poverty, hidden from the view of our major streets. And with the rising cost of living in our twin cities, it is becoming increasingly difficult for low-income families to find decent, affordable housing. Many families are forced to live in dilapidated trailers or run-down apartments, of which there are no shortages here. One of our future homeowners recently told his home sponsor that on stormy nights, he worries the wind will blow over the trailer he lives in with his family. He and his wife, who both work, fear for the safety of their children but can’t afford a better place to live. But now construction is underway on a well-built Habitat home that will be both safe and affordable for the family of five. At Habitat we envision a community without trailers that can tip over in the wind. We want all of our children to grow up in a safe, stable place where they can do their homework, play with friends and siblings, sleep peacefully and build hopes and dreams. Considering the need that exists, perhaps this vision sounds unrealistic. But that didn’t stop Trish Burk, Sam Sharp and others in our community 25 years ago when they decided something must be done to address our poverty housing problem. They didn’t have money, and they certainly didn’t know how to build a house. But armed with faith and love for their neighbors, they just went for it. First they read all the Habitat for Humanity manuals. Then they put an ad in The Eagle in 1989 that asked people to give donations in multiples of 89. The ad said that if all 115,000 people in B/CS gave 89¢, Habitat would have enough money to build the first house. But the first donation wasn’t even that much. It was just 69¢. I’m reminded of what Jesus did with the five loaves and two fish. Just as one little boy’s lunch fed thousands, our first little donor’s generosity and faith have been multiplied many times over. In fact, this fall we will start our 250th home in B/CS. But we intend to build many more houses and serve as many families as we possibly can. We have a number of families already in the Habitat program that are anxious to begin building their new homes. 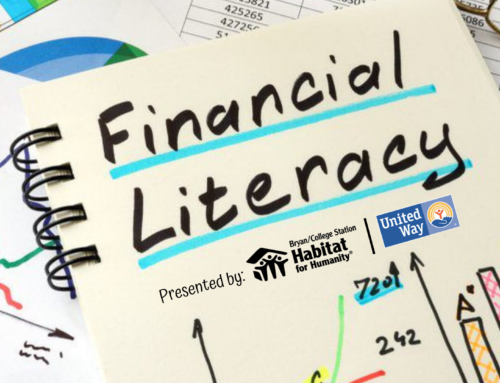 They’re working diligently to complete their required sweat equity hours and attend homeownership classes. We’re almost ready to build. We have the property and volunteers. Now we need help raising the money. If every B/CS resident gave just $25 in honor of our 25th anniversary, we could build homes for 88 families. Imagine the impact that would have! But as our first donor taught us, any size donation can make a great impact. And it doesn’t have to be monetary. You can volunteer, shop or donate at the ReStore, or donate in-kind materials or services. It all helps. Together let’s continue to build and improve our community for the next 25 years. Thank you for your support and faith.